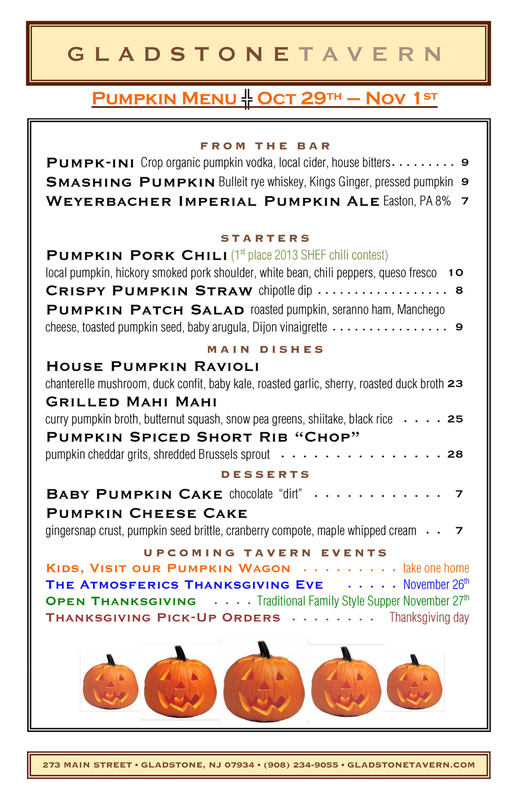 We're celebrating the fall harvest season with our Pumpkin themed menu — featuring Jersey fresh pumpkins grown at Melick's, Alstede and Uncle Bill’s Farms. or a Weyerbacher Imperial Pumpkin Ale. Our Pumpkin Pork Chili took home 1st place honors at the 2013 SHEF chili contest ! Main dishes include House made Pumpkin Ravioli with chanterelle mushrooms, duck confit and baby kale. The Grilled Mahi Mahi is seasoned with a curry pumpkin broth and the Pumpkin Spiced Short Rib "Chop" is accompanied with Pumpkin Cheddar Grits and sheredded Brussels Sprout. House made desserts include Pumpkin Cheese Cake and our Baby Pumpkin Cake sits atop chocolate dirt. Kids are invited to visit our Pumpkin Wagon and take a pumpkin home!